EAT&ART TARO is food combined with art. Taro, I doubt that is his real name, likes to make us think in how we eat and how we are as a community. 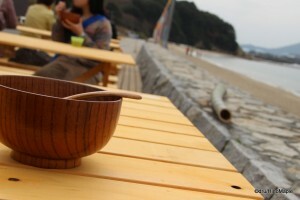 For the Setouchi Triennale, he “created” soup dishes to go with each season the festival is being held. For spring, he set up shop in the beach house on the west beach and created “Millenium Soup”. The entire series is called “Island Soup” and each season will bring a new soup dishes. Taro himself set up shop to explain things and personally stamp everyone’s passport. He explained the inspiration for the soup and how it was made. The soup’s original recipe was conceived about 1000 years ago and contains various local ingredients. The bowls and spoons were simple, and made of wood, but it was really great to help warm me up on a slightly windy, yet sunny, day. Taro continued to explain that the soup contained only had added salt and sesame oil for flavouring and that it was very healthy, or at least I think it was healthy. The taste of the soup was very, very simple. It was so simple that it didn’t have much of a taste other than a light seafood broth. My first bite into the soup was actually into a barnacle. Each bowl contains one barnacle and my teeth made a wonderful crunching sound as I cracked the shell of the barnacle. It was very tough, so be careful if you are trying to eat it. I found the vegetables inside the soup to be the most delicious part of the soup and the lightness of the soup was very refreshing. It may not have filled me up completely but it gave me more energy to keep going for the day. It was not a typical hearty soup that I’m used to, such as a clam chowder, but its simplicity made it good. Sometimes having a simple soup is more than enough to keep you going. The best part of the soup was that it appeared to have been made by the locals. It was nice to see all of the older ladies chatting away inside the kitchen and enjoying themselves while serving meals to the visitors. They had wonderful bento boxes for people to eat but unfortunately I didn’t have time to eat it. It was strictly a soup and dash affair for me. If you are going to the festival, please try the soup if you are there. 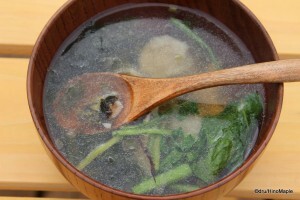 If you have the summer or autumn soup, please let me know how it tastes as I would love to try it, but I doubt I will. Taro himself is a very interesting character. He often wears a hat, or at least that is what I see in photos of him. 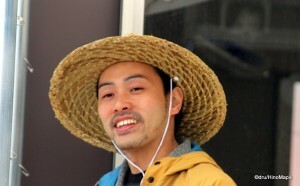 He has been to several different art festivals throughout Japan. He was at the Eichigo-Tsumari Art Field which is held a year before the Setouchi Triennale and also a Triennale art festival. Unfortunately the information about Taro and his projects are hard to come by. A lot of it is just hard to come by in English but his work fascinates me to no end. I enjoy his play with art and food and rather than putting a bunch of artificial sweetener packets on a podium, he actually does something to invoke thought into our society. It is great that he is doing this and I hope to experience his work again. I love to be able to interact with the art that I see, rather than just looking at it. EAT&ART TARO on Shamijima is part of a series of posts on the Setouchi Triennale. Follow the links below to read more about the different aspects of the Setouchi Triennale. This entry was posted in Setouchi Triennale, Shikoku Food and tagged art, EAT & ART TARO, EAT&ART TARO, food, Food and Art, Island Soup, japan, Kagawa, Millenium Soup, Seto Bridge, Seto Ohashi, Setouchi Art Festival, Setouchi Triennale, Shamijima, soup by Dru. Bookmark the permalink. I hope I’ll get to try the summer and/or fall version of the soup.